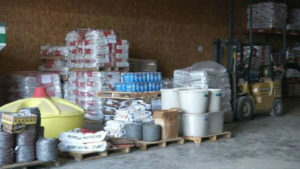 Farm supplies collected in Washington County to send to Kansas. Iowa farmers are helping out their counterparts in Kansas who saw wildfires spread across 20 counties and kill 6,000 cows. Washington County residents Megan Coakley of Wayland told KCRG TV that they’ve already collected donations of money and sent some materials to Kansas..
“It just got to be pretty heartbreaking and we just felt a need to want to help them,” Coakley says. Carol Horning of Washington has already made a trip to Kansas. “I asked my husband do we have extra hay? He’s like yeah and I was thinking a few bales and he said I could send a semi load,” Horning explains. She says things were worse than what she expected. “When we got there, the devastation was beyond anything you could possibly imagine,” Horning says. Washington resident Mike Berdo and his friends brought in a bunch of instant calf milk replace that cost nearly $3,000. Berdo told KCRG TV it was worth every penny to give it to the people in Kansas. “They have nothing left — literally nothing. Homes are burned, animals are burned, fences are gone,” he says. “We have to do something and this is what we’re doing.” Coakley and Horning used donation money to buy fence posts, barbed wire and other supplies at local stores to take to Kansas. “We’re all family. These people — we have no idea who they are,” Horning says, “Where we took this stuff — other than one person that I know down there — we don’t care where it goes to, we don’t know who it goes to. All we want to do is help because we know it could be us at any time.” Coakley is amazed at the amount of support from the community. She gets more and more calls every day from people who feel the same way and want to help. The group is getting ready to load up another semi full of supplies this (Friday) afternoon. Anyone who would like to contribute money or materials to help the affected farmers should contact Vision Ag located at 2952 IA-92 in Ainsworth.